I’ve mentioned before that when I entered the workforce, my idea of the difference between professional dress and professional dress was the difference between where you plied your trade. That is, my skirts were short, my heels were high, and I caused some ruckus for the HR group. In fact, I was so oblivious about the hazards of my hemline, that when I was offered a little lap covering in church, I just thought it was sweet that they were giving me a blanket. When I figured out that it wasn’t about my comfort, but the pastor’s line of vision, well, I was horrified, and my skirts haven’t been that short since. I also learned a great lesson in kindness from the way those church ladies treated me. No one tried to make me feel bad about my skirt. No one even mentioned that it was an issue. 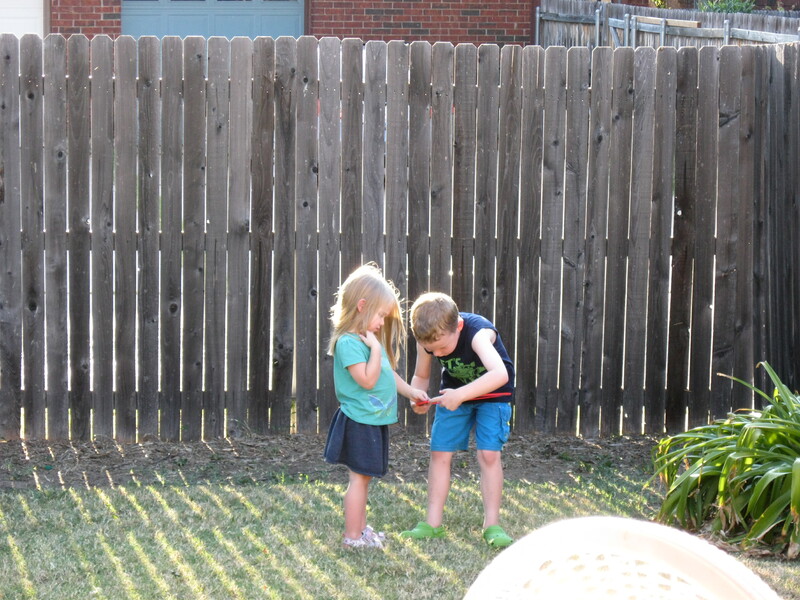 They simply offered me a solution that was comfortable to them, and comforting to me. You can’t really do that in a business setting–if your employee is flashing your clients, and your clients aren’t paying specifically for that privilege, you have to nip that in the proverbial bud. But, you can do it in such a way that your employee walks away with his/her dignity*. An old friend of mine had a theory about buying dresses. “If you wear a size 6/8, then Work-Cute is a size 8. Date-Cute is a size 6. Always go to the larger for work, and tight-tight-tight for the date!” She had two, identical polka-dot dresses, one in her Work-Cute size 6, and her Date-Cute size 4. My then-work-cute-size 10 would just sigh and keep puffing alongside her as we jogged through River Legacy park. It is fortunate that I don’t have any ego attached to how I look when I am working out because when Carrieanne worked out, she just got prettier. She had this amazing, thick ponytail that swung like a pendulum, and she was a gorgeous tan that just flushed rosy when she was overheating. This opposed to how I sweat like a swamp rat with my thin hair matting down to my scalp, and how when I get hot my skin turns red enough that observers frequently find it alarming. You know, when I was a baby, my skin would turn so red when I cried, my mother actually took me to the pediatrician. I’m telling you, when I get hot/angry/upset/laugh really hard, my skin is… If it weren’t my own, I would find it fascinating to watch it turn colors. As it stands, I just know I can’t play poker and that aggravates me. *Ideally, dress code is something that should be covered during the interview process. That allows a potential employee insight into the work environment, and gives him/her the opportunity to determine whether or not he/she is going to have to completely overhaul the wardrobe to adjust. I finally finished reading Girls Like Us, and I’ve got 5 stars for it. I won’t write a proper review of it right now because I’ve only just put it down about half an hour ago, but a little conversation I’ve been having on Facebook has outgrown its venue and I am moving it over here. And that conversation? The ugliness of the 70s. This is where my Facebook conversation started: Even attractive people were not attractive in the 70s. It was impossible to be truly attractive from about 1970 through about 1986. The 70s were to American style what the ages of 12 to 16 are to most children. Awkward. Pimply. Greasy. Brace-faced. Gross. I was born in 1970. The year of the Dog is right. Dog ugly. Everything was vinyl and polyester. The most fashionable colors were avocado, harvest gold, apricot, and brown–even in summertime! People wore bell bottoms, leisure suits, terry cloth, and collars so long and pointed they could touch the edges of their shoulders. Carpets and hair had the same shag styling. Miss America looked like this and Elvis was fat. Me. And everything that was wrong with 1975. Polyester jumpsuits–oh yeah, that was a one piece that zipped up the back. Wingtip collars. Furniture in Harvest Gold and Earth. Painted bricks. And, as I recall, that throw pillow would have landed on a couch with a huge, sticky vinyl cover on it. What you are missing is that when my hair wasn’t teased into presciently 80s oblivion, it was parted down the side so that I looked like Rob Reiner as Meathead from All In The Family. Ugh. Everything was SO UGLY. The 70s was a sweaty decade. Everyone always looked slightly overheated. In part, due to the grotesquely shimmery makeup that was popular, and in part due to the fact that the most popular fabric was a non-breathing synthetic. You couldn’t help but sweat. You couldn’t help but look like you needed a shower. And the hair…oh, the hair. 70s hair is infinitely worse than 80s hair. Yes, 80s hair is large and overprocessed, but 80s hair is also largely clean–or, at least it is easier to hide a greasy scalp behind 3 inches of teased bangs. In the 70s, with everything parted down the middle, you could just–yuck. Okay? And on television? Was there an attractive man on television? I know there were attractive women because I watched Charlie’s Angels and Wonder Woman with a religious fervor, but think how much better looking those shows would have been, had they been initially produced today! I mean, Farrah? Farrah in her prime taken outside the 70s? She would have been too much for television. In a way, I suppose we were fortunate that the burgundy blush, and frosted eyeshadows toned down her hotness. We’d have been all sweaty for a different reason. I did have crushes on David and Shawn Cassidy, Andy and Barry Gibb, and Dirk Benedict (as Starbuck–the only Starbuck, thank you.) 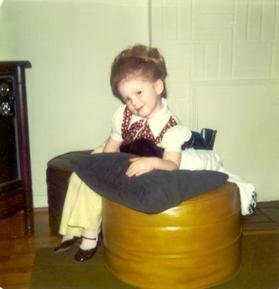 But even as a child I understood that their pants were freakishly tight, their hair unflattering, and their satin Members Only jackets gauche. You worked with what you had in the 70s, and what I had was poofy-headed, tight, sateen pant wearing, hairy-chested pretty boys. This post… I started this post 3 hours ago, then went searching for a picture from a yearbook. 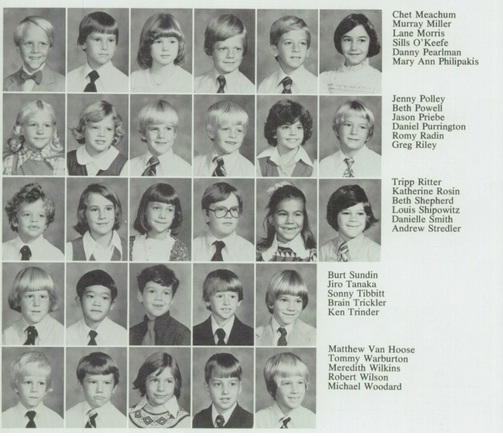 I got sucked into classmates.com, where there are yearbooks online, then ancestry.com, which is like crack cocaine to me. I couldn’t find my Kindergarten yearbook picture, then I remembered that my picture was so bad, it was not included in the Kindergarten section of the book. I had a massive cold sore that ran from inside my lower lip, halfway down my chin, covering the entire lower left side of my mouth. They took my picture in profile and it was still visible. I sport a lovely scar which is nicely apparent when I get overheated. I guess the school didn’t want people to think they let lepers go to class. My first grade yearbook isn’t online. Thus and so, I give you my second grade picture, taken in 1978. I look really happy to be there, don’t I? Oh, there’s a story behind that one. But not for tonight. I need to get off this computer before I turn into one! Top row middle. That’s me. 3rd row end. That was my adorable boyfriend through fifth grade, until we moved to Texas. And even then we wrote letters for a couple of years. The 70s were kind to him. Five months into the year, I finally kicked off my “entertain/socialize more” resolution from New Year with a little garden dessert party, which was very, very satisfying. 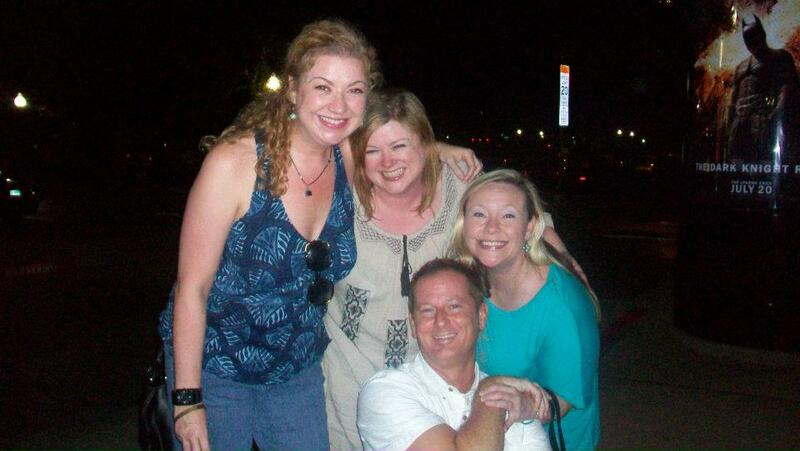 I know some really wonderful people, and I was happy to have so many of them gathered in one place. I was also happy to feel like I could set up a good looking space for our dessert spread. I showed you how I recovered my cafe table set for the party. 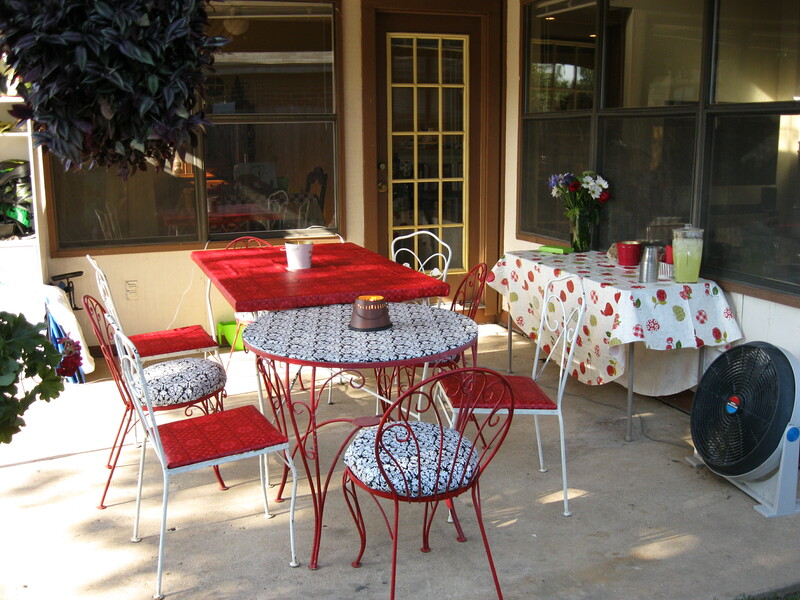 I recovered my patio dining table and chairs with a red-on-red tonal, print tablecloth by Paula Deen, also purchased at Ross for $4, and I used another $4 Paula Deen print as a tablecloth for a little card table, where we set up prizes and food. I think things mixed and mismatched nicely. For the party, I made brownies, mini-cupcakes, and soft pretzels. My friend, Francine, made some amazing lemon sugar cookies, and we also had a cheese tray. For drinks, we went through two pitchers of lemonade and some ginger ale, and those of us who imbibe had Birthday Cake cocktails: 1 part Cake flavored vodka, to 2 parts ginger ale, on the rocks. 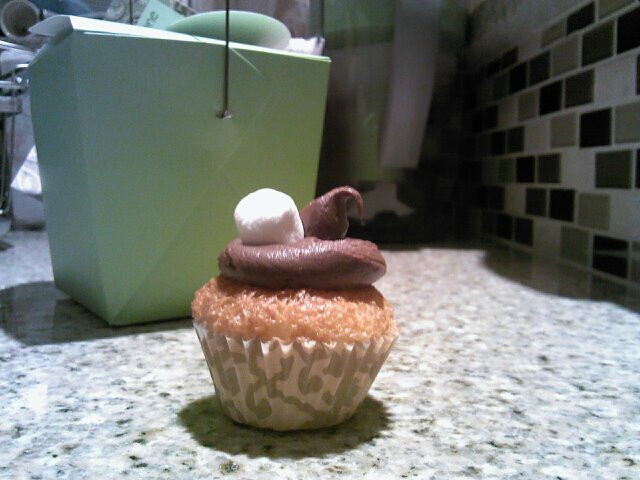 Mini-angle food cupcake with chocolate icing (piped on with a ziplock bag that I cut the corner out of) topped with a mini-marshmallow. 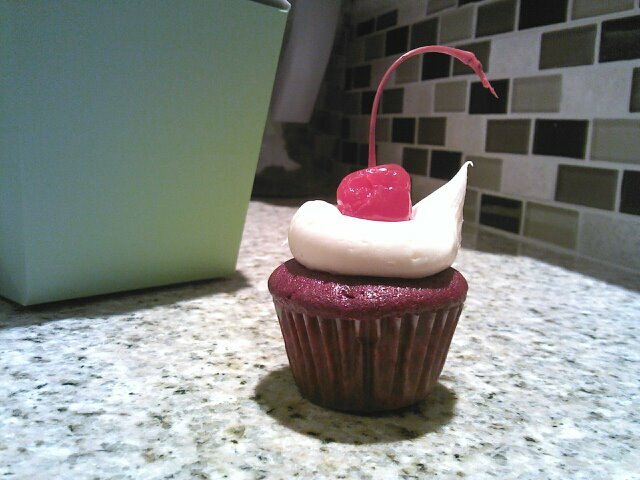 And the mini-red velvet cake cupcake with cream cheese icing (same piping technique), topped with a stemmed, maraschino cherry. I based these off of one of my screen print designs. Food imitating art! 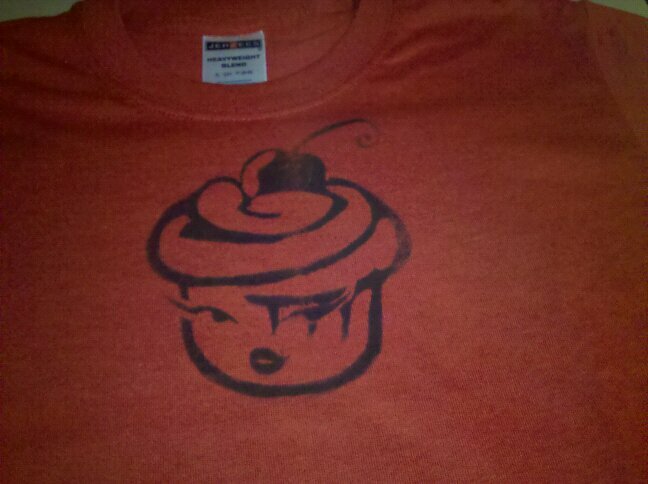 Cupcake Ninja! You can still order these, by the way. $25 for a tshirt. If you want one, contact me through lane@theoutsidelane.com. So, great party! No one cried. No one threw up. No one salted the earth in front of my door. And Thor got to play with my friend Emily’s delightful daughter, who is the teensiest, most adorable, fairy-pirate I know. Here, Thor coaches MissA on her frisbee grip.